Goldenseal – Parts Used: Rhizome and dried root. The active ingredients have an antibacterial, anti-inflammatory and antibiotic effect. * Traditionally was used for skin and eye infections, for diarrhea, respiratory tract infections and irritations of the respiratory, digestive and urinary tracts. Before antibiotics, was used for gonorrhea and syphilis. 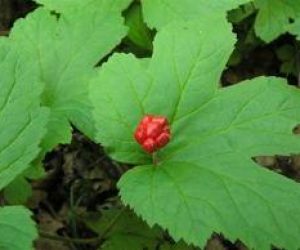 * More recently goldenseal has been used to treat complaints such as Crohn’s disease, general infections, and is often combined with echinacea for the treatment of cold, flu and congestion. It is a tonic for the immune system, improves the function of the colon, spleen, pancreas, liver, respiratory and lymphatic systems, reduces blood pressure, improves digestion and regulates menstruation. Goldenseal can be used to reduce inflammation of the mucous membranes and can reduce the irritation caused by hemorrhoids and is a useful laxative. When applied directly onto the skin it is useful for ringworm, eczema and other skin irritations. 4 – 6 gm daily in divided doses may be of assistance or use according to label instructions. It is recommended to take a break from continuous use of goldenseal. It is recommended for 1 – 3 weeks on, and at least 1 – 2 weeks off. The powder dissolved in warm water can be used as a gargle for mouth infections. * Do not use for prolonged periods during pregnancy or lactation. * Consult your nutritionally oriented physician before supplementing with goldenseal if you have diabetes, glaucoma or cardiovascular disease. * Prolonged periods of use may effect the gastrointestinal and nervous systems. There is no comment yet!